Located in St. George Bermuda behind Kings Square, Bridge House is one of the oldest buildings of the island. The present house was built in 1707. The original house was built in 1600s. It was made of wooden frames and built by a planter and shoemaker Roger Bailey. The house which looks almost new, is now a property of Bermuda National Trust. It used to be the residence of Governor Benjamin Bennett in early 1700s when Bermuda was a British colony. A well known mid 1700 residents of the house was privateer Bridger Goodrich who came from Virginia and was a loyalist to the king. He purchased the Bridge House for $1,000 in cash. He was known for blocking America's sea trade along Bermuda's waters. He also captured local vessels which resulted in violation of the legislation that was in place then. The house was named Bridge House because there is a small wooden bridge at the opposite side leading to the St. George's Harbor. 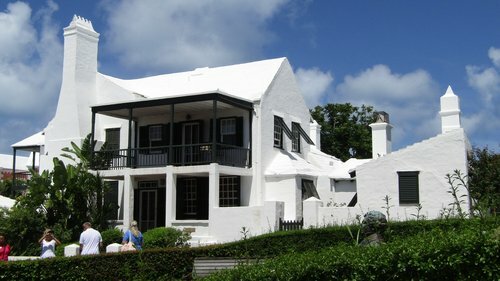 Bridge House is split up into an art gallery and a guest apartment, both under the management of Bermuda National Trust. The gallery is in the ground floor. It has many great collections and antiques including original and rare paintings and handcrafts created by local artists. Many prominent artists including Alfred Birdsey, Hereward T. Watlington and Sam Morse-Brown have their contributions in the Bridge House Gallery. There is also a studio inside belonging to the famous Bermudian artist Jill Amos Raine who has been known for his great watercolor paintings. Bridge House Gallery is open on Wednesdays & Saturdays from 10am to 6pm. Admission is free. Update November 2014: The Gallery was operated as The Bridge House Gallery between 1975 to 2003. Subsequently in 2013 it was taken over by Bermuda National Gallery.... it was then named as BNG-East operating as an east-end branch of Bermuda National Gallery. Sadly it's now closing down due to lack of sponsorship. Update May 2015: The fully air conditioned gallery with a covered space of 1,030 sq. ft. is offered on commercial rent. The two bed-room 1,200 sq. ft. budget apartment is in the upper floor of the building. It's offered on monthly rent. It's an ideal but basic accommodation for a couple who like to be living in St. George's in a historic house while conveniently located within easy walking distance from the main landmarks. The house is half a block from Kings Square town center. It has a lovely private veranda overlooking the town square. Full laundry is available. The apartment has nice internal architectural features with wooden floors. There is also a walled private garden. Bridge House is at a walking distance from shops, restaurants and transports. Wahoo's Bistro and several other restaurants are close by. There is a grocery store a block away. You will also get buses to Hamilton City just 3 blocks away leaving every 15 minutes. The Tobacco Bay Beach and St. Catherine Fort are short walk from the house (about 20 minutes). The guest apartment is nice and well maintained, however shares a common entry with the gallery below. Minimum night stay requirement applies. Monday - Sunday, 11am - 4pm. Closed on Public Holidays. 2) Check out Bermuda Apartment Rentals to know about many other great budget accommodations in Bermuda. 3) Check out St George Attractions to know about all the great things to see in St. Georges. 4) Check out St George's Town to know about the historical Town of St. George, its attractions, activities, restaurants, hotels and more. 5) Check out St. George's Parish to know about the parish where the town of St. George is located and all its attractions and activities. Bridge House is near the State House. This was the original home of William Pearman. He gave land to his daughter and my ancestor Thomas Handy to the West of this building/home which is still standing. Thank you!